As a Brit who was born in the late eighties, my early childhood was surrounded by the tail end and aftermath of the Margaret Thatcher administration, a period in modern British history that could be argued to have been the most divisive in the last fifty years. Perhaps the most defining aspect of the Thatcher years was her commitment to reducing the power of the country’s trade unions, and this was highlighted most notably in the bitter miner’s strike of 1984-85. 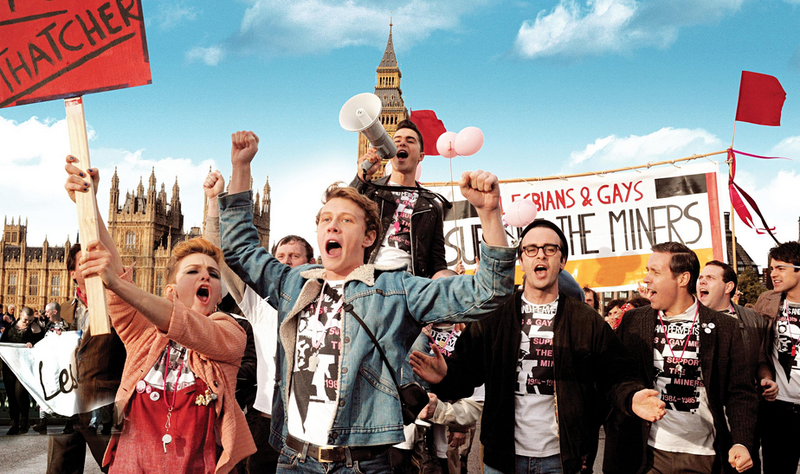 In the time since Thatcher’s tenure as Prime Minister ended, numerous films have been made about and involving the strike including Billy Elliot and Brassed Off, but in Pride the audience are given a side of the story that they might not have heard before, the tale of an unlikely union between a struggling Welsh mining town and a group of LGBT activists from London. Inspired by true events, Pride tells the story of LGSM (Lesbians and Gays Support the Miners), a group founded by young activist Mark Ashton (Ben Schnetzer) that recognised the similarities in discrimination and persecution between themselves and the striking miners and decided to raise funds in order to support their plight. After being rejected by a number of mining communities in an ironic sequence of unjust prejudice, LGSM’s support are finally, but tentatively, accepted by a small Welsh village and the film proceeds as a moving and delightful narrative of learned acceptance and what can be achieved when unlikely forces combine for a worthy cause. 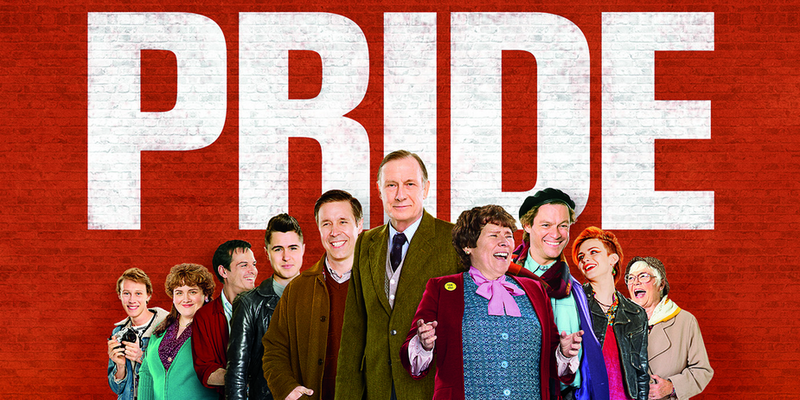 To put it simply, Pride is an example of British filmmaking at its very best. It has found within its subject matter and writing the glorious combination of charm, heart, power and information that places it shoulder to shoulder with other contemporary classics like The Full Monty, Trainspotting and This Is England, all examples of cinema quintessentially British yet carrying a universal message and appeal. The relationship that unfolds between the enigmatic group of ‘gays’ and the charismatic crew of naive villagers is a joy to witness, full of endearing subplots and rewarding story arcs, and importantly, though the film is full of exaggerated characters on either side, the portrayals never stray in to the realm of ridiculousness. Admittedly, the filmmakers have chosen to ‘play safe’ with regards to many of the narrative’s more sinister and uncomfortable elements, choosing to focus more time on the humorous and light hearted sequences between LGSM and the miners than they do on the very briefly noted instances of homophobic violence and reality of the 1980s AIDS epidemic. But I feel this ultimately helps to make the film more palatable and uplifting for as wide an audience as possible. It is a rare and beautiful occurrence when a film can satisfy the full range of audience emotions, and in the space of one hundred and twenty minutes Pride evoked in me feelings of joy, sadness, disbelief, euphoria, mirth, you name it, I experienced it. Though on a general level Pride is very much about themes, acceptance, resilience, etc., the heart and brilliance of the film lies in its exceptional cast. A wonderful list of British stalwarts and various newcomers combine to create perhaps the most likeable and endearing set of characters I have experienced in the last five years. There is not a single bad performance among them, with Ben Schnetzer giving an endearing and memorable performance as Mark Ashton, the driving force behind LGSM. Other performances of note on the ‘London side’ are given by Dominic West, Andrew Scott, George MacKay and Joe Gilgun who succeed in providing multiple and varied representations of the gay community ranging from stereotypical flamboyance to reserved and slow self realisation. It is the actors portraying the lead Welsh characters, however that truly bring the film to life. Paddy Considine, Jessica Gunning, Bill Nighy and Menna Trussler all shine as members of the mining community who fight their own peers to garner acceptance for their new friends, all giving both hilarious and touching performances. The overwhelming star of the show, however, is Imelda Staunton as Hefina, a fierce committee member who immediately takes the LGSM members to her heart. Equipped with hilarious one liners and a ferocious mind for justice and equality, Staunton embodies the viewpoint of the audience with her ardent support for the miners and unabashed acceptance of her newfound London companions. A memorable performance that is sure to gain some BAFTA attention when the time comes. Overall, Pride has filled my heart with joy and shot straight in to my top three films of the year so far. It is not the gritty, ultra realistic portrayal of the miner’s strike that so many other pieces of media have displayed over the years, but it is a true story nonetheless and one that has been told in great celebration and reverence of those who participated. It is hard to put the feeling in to words, but the sheer glorious force and atmosphere of a film such as this leaves you feeling like you have experienced something very special indeed. ‘Against the odds’ types of pictures hold a very special place in my heart, and the narrative of Pride is the epitome of such a tale, a story of struggle, acceptance and overcoming obstacles that will have even the most cynical of movie goers wiping away a tear or two by its conclusion. Truly a must see. Saw this film on Sunday and really enjoyed it. Must admit you did a better job than me in reviewing the film. Mark Kermode has been tweeting that there have been standing ovations in some cinemas. You had me at the comparison to This is England. I will be seeing it as soon as I get the chance! It’s similar in the sense of British excellence, but This Is England is certainly a far grittier film! I LOVE Joe Gilgun. Got to see this! I have yet to hear one bad word about this. Can’t wait to watch it.